The Women's Museum in Denmark harbours Danish sculptor Jens Galschiot‚s artwork ŒIn the Name of God‚. 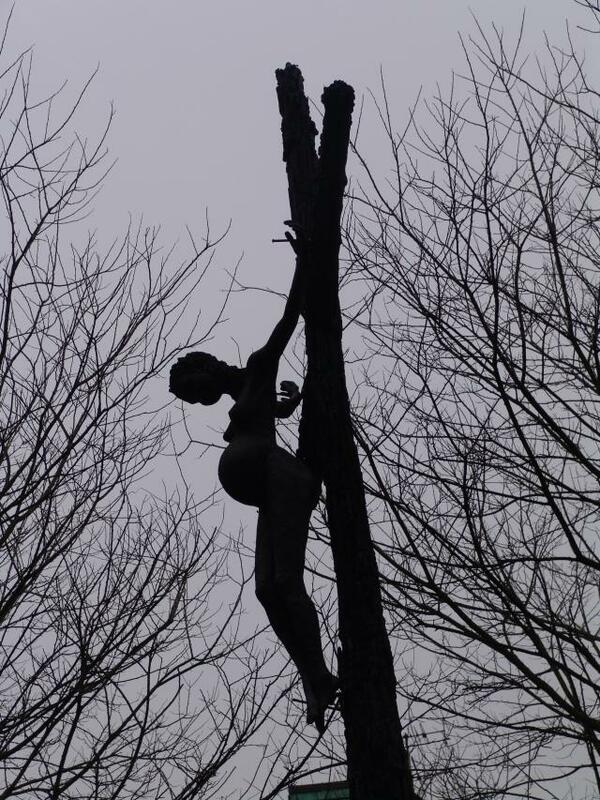 The 7 metre high sculpture depicts a crucified pregnant teenager. The crucifix was put up on Wednesday 14 February at the Women‚s Museum, neighbouring the Cathedral of Aarhus. At the inauguration there were speeches by Mr Bjarne Oerum, chairman of the parish council, curator of the museum Ms Merete Ipsen and the sculptor Jens Galschiot. Mr Oerum stressed the role of art for the renewal of the churches. Ms Ipsen emphasized the role of Mathilde Fibiger, born 1830, who had given name to the square of the exhibition. She was a pioneer for the Danish women‚s emancipation. Ms Ipsen stressed the affinity between the pioneers and the cause of the sculpture. The controversial sculpture has been exhibited for a couple of months in front of the Cathedral of Copenhagen, where it was put up in co-operation with the Dean and Parish Council. The exhibition in Aarhus has also a connection to the Cathedral, although the sculpture is displayed under the auspices of the Women‚s Museum. The artist has recently been to Nairobi where he displayed his crucifixion sculpture. The reactions of the 66,000 participants of the World Social Forum were generally benevolent. Especially the women in the demonstrations in the streets of Nairobi and at the venue of the WSF adopted the sculpture and saw it as a symbol of the oppression women that usually follows in the wake of the fundamentalists‚ campaign, Jens Galschiot declares and continues: So I‚m delighted that exactly the Women‚s Museum is the driving force for launching the sculpture here in Aarhus. Short presentation: The artist was born in Denmark, 1954. He stakes his art to defend the ethical values of our society, regardless of political, religious or economical interests. His sculptures suddenly appear in public areas and start the performance. Best known are My Inner Beast (European cities in 1993) and the Pillar of Shame (Hong Kong, Mexico and Brazil).